Ultra-compact for Up-to-date Devices Designed with M.2 2280 form factor (80 x 22 x 3.5 mm), M55 M.2 2280 SSD features the super compact size and case-less design that make it applicable for tiny-and-thin devices such as ultrabooks, tablet computers and mini PCs. 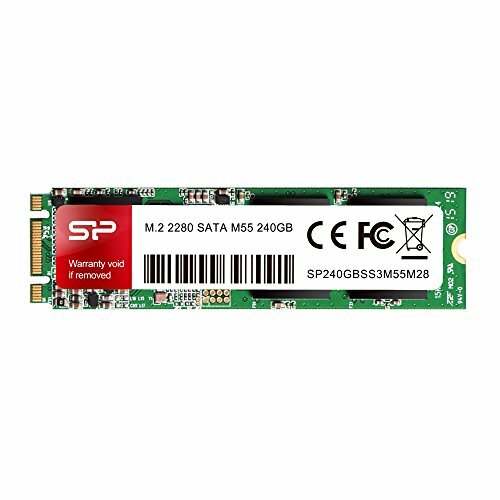 Enhanced Performance for Intensive Workloads Equipped with high-quality synchronous NAND flash chips and SATA III 6 Gb/s interface, the M55 M.2 2280 enables impressive transfer rates to offer you an instant upgrade solution whenever it comes to the daily computing applications or demanding multitasking. And it applies the intelligent SLC cache technology that can boost writing performance to even higher peaks. IntelSRT Supported for Flexible Configuration Intel Smart Response Technology (ISRT) is supported to enable flexible computer configuration for improved overall performance and efficiency. The ISRT enables to automatically identify and store your most frequently used applications to the SSD while letting you to have a hard drive with its full storage capacity. As such, you can enjoy the high-performance and cost-effective upgrade solution by using a lower-cost, small-capacity SSD applied in conjunction with a low-cost, high-capacity HDD. Free-download SSD Health Monitor Tool - SP Toolbox Software The M55 M.2 2280 comes with a free-download SSD health monitor tool - SP Toolbox Software, which is especially designed for you to easily monitor the current health status of a SSD. By such, you can run a performance test, get an overall health evaluation and check detailed information about your SSD, including used space on device, device temperature, total bytes written, S.M.A.R.T. status, erase count status and block numbers.